About a week earlier I posted a back cover blurb for a science fiction novel I’m writing. I’ve been working on this for well over a year thanks to a dream I had one night. The prologue below is the beginning to a futuristic novel set in 2037 of a post apocalyptic society. You can call it science fiction, fantasy, or speculative fiction. To me, it is a fiction story using elements of myth as well as realistic threats to the future of humanity. It prays upon our fear of society falling a part, but eventually shows how people can find love even in the most extreme situations. Without further hesitation, here is the prologue to my work in progress. Please feel free to give comments and criticisms. 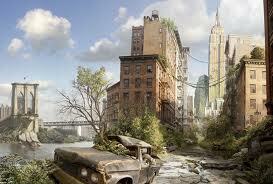 In 2037, the world feels alien compared to what it was a few decades ago. Scientists believe that long term exposure to radiation started it all. It took decades for the radiation to change the genetics of humans. Our superiority made us ignorant to how much was changing underneath our skin. Humanity thought it was indestructible. Top of the food chain. King of the jungle. That ignorance would be the downfall of the human race. Since the creation of the atomic bomb and multiple nuclear disasters (Chernobyl 1986, Three Mile Island 1979, Japan 1999, 2011) humans have been exposed to ionized radiation on a massive scale. More devastating than X-Rays and cell phones, nuclear power became a weapon beyond simply destroying life. Those that died were mourned, but we neglected to step back and look at the big picture. We focused on curing the individuals with the most radiation levels. Doctors were certain that there was no prolonged effect besides the increased possibility of cancer. Researchers created a safe level of radiation that could exist in humans that they guaranteed it would not be harmful to have some radiation in us. They were all wrong. What they didn’t know is that the radiation was still working inside people’s bodies. It removes electrons from molecules, which can create terrible effects on the human body. There is typically a low white blood cell count in those with radiation illnesses. Blood transfusions were a common treatment to those exposed. It helped to replace the affected cells. The point is that radiation changes your cells. All of the known symptoms were being treated, but there was one that remained dormant. People never imagined that radiation would change our genetics. It was only until 2021 that the final symptom began to show. At first, it was just one or two people out of billions. They were deemed insane and locked up. No one thought there was a biological reason for them to eat people and drink their blood. It was the genetics no one bothered to study. Fiction is a genre stemming from reality. In some way, fiction derives from truth and changes in the eyes of the writer. Whether it be an experience from the writer or a memory from someone else, fiction comes from something we know and changes to become something different. Science fiction, however, is a type of fiction where we claim to know how current technology and science will transform in a different reality or future. It can be a parallel universe or 1500 years in the future. Yet, the alterations made in science fiction stories are not just musing of an author’s wild imagination. Many of the devices, inventions, and discoveries in the most famous fictional stories have been predictions for real world events. Today, I will take on a journey through the minds of the best future tellers known to mankind…science fiction writers. We will discuss how questions of the universe and space were answered in stories, years before we actually discovered them. We begin our tour of science fiction predictions with Jules Verne. He was a French writer living in the 1800s and made drastic predictions of space exploration that eventually came true 100 years later. 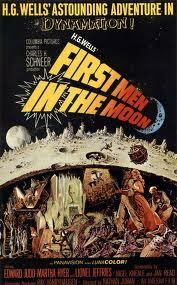 In his book, From Earth to the Moon, Verne described down to mind-boggling detail the trip to the moon. The launch site and water landing of the capsule are eerily close to what happened in reality. Even the material the capsule was made of (aluminum) and the number of men on the voyage (3) are similar to what we experienced in 1969. Verne’s book was published in 1865 and he was so precise in his details that the fictional capsule was named Columbiad. Drop the d and you have almost an exact prediction of how man got to the moon. Forty years later, another legendary sci fi writer, H.G. 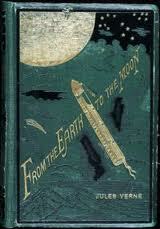 Wells, wrote a similar account of moon landing in the 1901 novel, The First Men in the Moon. While H.G. Wells’ predictions were located more on Earth, we’re hoping his prediction of time travel will soon be upon us. The next precognitive writer is Arthur C. Clarke who commented not only in his fiction, but in scientifice journals made predictions about technology. In 1945, he had an idea of communication through satellites that synchronized their orbit with the Earth’s equator (geostationary satellites). The idea was coined first in 1928, but was made popular by Clarke and 20 years later it was made a reality. They are affectionately known as Clarke orbits for his faith in the technology. Through his book, 2001: A Space Odyssey, Clarke was able to give a realistic experience of what happens to a human body in space (while other science fiction movies over dramatize the event) and even mentions the existence of a black hole on one of Saturn’s moons. Although it is not recognized as such, Clarke comes back to the black hole idea in his story the Black Sun in 1956. 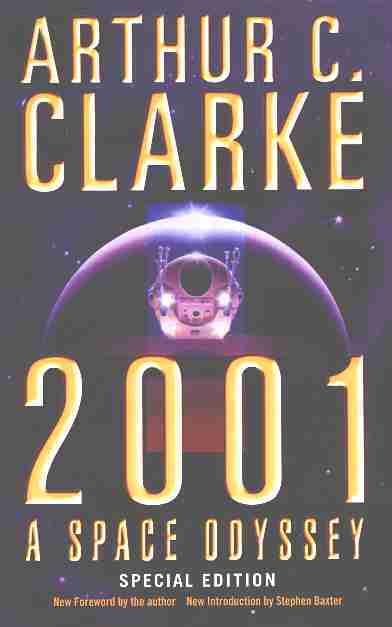 Over 10 years before the coining of the term black hole, Clarke manages to use it in his stories as a normal aspect of space life. He even goes on to predict in 2024, that we will use infrared signals to find an advanced civilization at the center of our galaxy. What is most unsettling about this prediction is that infrared telescopes are being used as we speak to locate stars and planetary bodies, which could someday return with intelligent life. Now these three men are part of an elite group of science fiction writers who have been able to accurately describe events and inventions that will eventually be created. It is insane to think that black holes and satellites were once figments of a man’s imagination and now they are truths we accept in reality. To aspiring speculative and science fictions writers, it takes a lot of knowledge to become as legendary as these men. However, it is not impossible to fill their shoes. It is important to focus on what we know now and project what could potentially happen in the future. I am shocked and proud to know that fiction writers (in essence liars) have been absolved of their mockery because their predictions have come to pass. It is comforting to know that writing entertains, incites emotions, and helps shape the future of our species. What do you predict will come to pass in the next year? The next 25? The next 100 years for humanity and our technology?